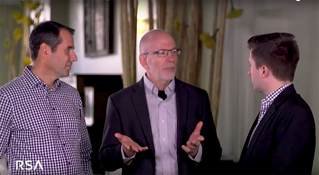 In this short video interview for RSA, Jack Jones, Chairman of the FAIR Institute, and RiskLens CEO Nick Sanna give a high level introduction to the value proposition of FAIR: changing the mindset among risk professionals that keeps them in permanent crisis mode. Jack and Nick were interviewed by Jonathan Gregalis, Digital Content Strategy Manager for RSA, at the RSA Charge event in Dallas that followed FAIR Conference 2017. Jack was a panelist at RSA Charge, and Nick demonstrated the two-way integration of the RSA Archer GRC solution with the RiskLens CRQ platform. Jonathan: In your keynote address at FAIRCON, Jack, you talked about the great lengths that the industry still needs to go, that risk management practitioners still need to go, to get to this kind of holy grail that you’re talking about. In your perspective, what lies ahead? What do risk management practitioners need to be thinking about, need to be prioritizing, or what new challenges are ahead that we may not even be talking about? Jack: So, how much time do we have? I’m serious about that because there’s no shortage of challenges, and some of them are really foundational because, for example, if you think of something as simple as terminology, and if you ask six different people to give examples of risks, you’re going to get, generally, six very different things. Often, the things they describe as risks technically aren’t. So, if your foundation in that understanding of terminology is that problematic, the rest is a crap shoot. The example I like to use in front of audience I’ll ask, how many people here given the opportunity would ride a space shuttle mission? And generally, a third of the hands go up. And I say, how many of you given that opportunity would ride that mission if you knew the engineers and scientists who planned the mission and designed the spacecraft couldn’t agree on the definition of mass, weight and velocity? Well, I have nobody yet willing to ride that mission. But that is the mission, my experience, we take our stakeholders on pretty much every day. We use foundational terminology so inconsistently and incorrectly. But once you take that first step and get those foundational elements, you normalize terminology and the mental models that help people think about risk, it’s a huge lift in your ability to have much clearer conversations about the problem and measure it far more effectively. So that’s really where it’s headed, is that clarity and normalizing the conversation and measurement methods. And the sky’s the limit after that. Nick: I think on that basis, a mindset change can happen. As he says, the sky’s the limit. Practically, how it materializes, often you see companies paralyzed by trying to go after the latest crisis. And they become in permanent crisis mode because they don’t have a good way to prioritize what matters or what can make a difference in the long term. FAIR, in partnership with RSA, allows us to get out of that mode of firefighting all the time, and think about what is my long-term risk position, how can I improve it systematically, based on impact my action would have on the business. Jack: I think RSA’s reach and credibility within the industry is critical in helping the industry take these next steps. So that’s another reason why we’re so excited about this. Jonathan: And we are as well. Jack, Nick, thank you so much.